Speaking to Elragail for the first time will have her say: "My name is Elragail. I look after Thamriel. He's [sic] a little strange. 'Touched by the Gods', they say." 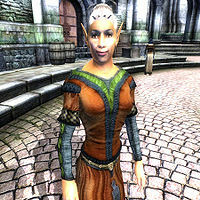 Asking her about the Imperial City will have her say: "Thamriel says she hears voices. All the men and women who lived and died here for thousands of years... maybe they left ghosts behind." She wears middle-class clothes consisting of a russet felt outfit and thick cowhide shoes. She carries burgundy linens, Thamriel's house key, and a medium amount of gold. She uses a major leveled Illusion spell which is Chameleon, Invisibility, or Silence. This page was last modified on 13 July 2018, at 03:40.